Zman Magazine was asked to put together a magazine for follow up to the Internet Asifa. 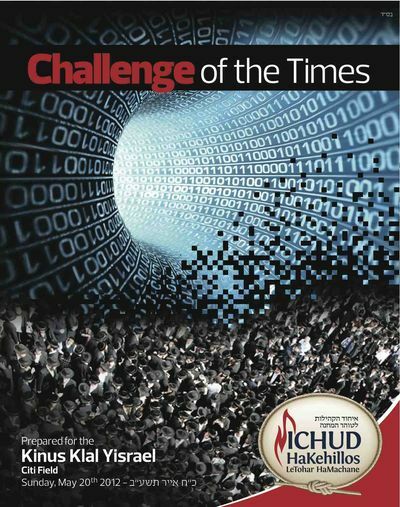 The following article by Rabbi Yosef Viener appears in the magazine. Here, too, is a PDF (Rabbi Viener – Family Security) of the article that you can feel free to download and distribute to others. You can read a scaled down version here and listen to a lecture that the article was based upon here. I have internet in my home and office, and a friend of mine claims that if I do not filter or monitor the content, I could be violating the issur of lifnei iveir lo sitein michshol (“do not put a stumbling block before the blind”). He argues that my allowing unrestricted internet use by my family and employees will no doubt cause them spiritual harm, and the responsibility for the damage will be partially my fault. This concept is new to me. Is it indeed necessary for me to install the proper filtering software, or is it merely a suggestion for those who want to be machmir? We are going to discuss an issue that might seem like an old topic, because there have been many gatherings to address the issue. Much to my surprise and chagrin, however, the message does not seem to have hit home. The security we will discuss is that of the sanctity of the family, which is currently suffering from the most insidious and dangerous attack ever leveled against it: the internet. If you are about to turn the page because you feel that you have heard all there is to say on this subject, please bear with me for a few pages. First of all, I doubt that you have heard everything. Second, even if you do not think that the subject pertains to you, you might learn in the course of the essay that it does. In my years serving the frum community, there has never been a burning issue that affects the community at large as profoundly as this one does. If I may borrow a term, the internet is the “silent killer” of the neshamah. It is very silent – it can be used in the privacy of a closed room in the home or office – and it’s very deadly. One can commit spiritual suicide, and those around him will be none the wiser, until it is far too late. No one can know whether this problem affects a neighbor, a tablemate in shul or a chavrusa sitting across from you. As we will see, if it affects someone in your close circle of acquaintances, then it affects you as well. Yet, people are either oblivious to the danger or are deliberately choosing not to focus on it. This entry was posted in Internet Addiction and tagged accountability software, Asifa, filtering software, Internet asifa, issur yichud, Rabbi Veiner, Rabbi Viener, reporting software, Viener.